Mack, who has not missed a single snap in his five seasons with the Browns, is eligible for free agency this winter. 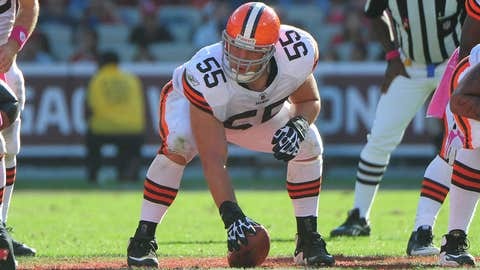 BEREA, Ohio (AP) — Alex Mack’s five seasons in Cleveland have been challenging — to put it mildly. The steady center has endured almost constant losing, seemingly endless coaching and quarterback turnover, front-office upheaval, even an ownership change. It’s been tumultuous. But with so many reasons to leave, Mack, eligible for free agency this winter, said he wouldn’t mind staying. "Cleveland is a very easy place to come back to," Mack said Friday. "I like the coaches. I like the players. I have a house here. So without a doubt it would be very easy to come back." WILL GORDON WIN RECEIVING TITLE? There’s no guarantee that Mack, who has never missed a snap with the Browns, will return. And as he prepared for Sunday’s game against the rival Pittsburgh Steelers, he considered that his days in Cleveland could be down to a precious few. He’s not alone, either. Starting strong safety T.J. Ward and inside linebacker D’Qwell Jackson face uncertain futures, too. Earlier this week, Ward, also poised for free agency, said he wants to finish what he started. "I like my team. I love my teammates. I love being in this city. I love the organization," said Ward, who has had a Pro Bowl-caliber season. "We haven’t had many wins, but I think we’re building something here, and I think it’s being built the right way. Sometimes things don’t happen right away. It takes a little bit of time, but good things are worth the wait in a lot of cases. "We’re starting to build something," he said. Jackson, too, wants to remain with the only NFL team he has known. But the eight-year veteran is due a $4.1 million roster bonus in March, and because he’ll be 31 next season, there’s a chance the Browns may decide he’s not worth the investment. Jackson can’t imagine going anywhere. "I’m stuck to Cleveland, it’s going to be hard to go somewhere else and play," he said. "I know it’s the nature of the business, things may change and I’m fully aware of that. 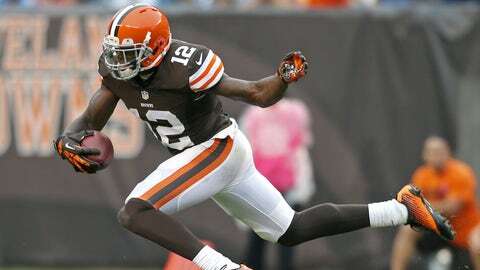 Right now, I’m a Cleveland Brown through and through." The Browns, who carry a six-game losing streak into the finale, will enter the offseason with major decisions. Near the top of the list are the futures of Mack, Ward and Jackson — unquestionably three core players. Mack has not only been durable — he’s started all 79 games since he was drafted in 2009 — but the 28-year-old has developed into one of the NFL’s top centers. Pro Bowl tackle Joe Thomas, an Iron Man himself with 111 consecutive starts, admires Mack’s sturdiness at a physically demanding position. "The center position gets rolled up a lot because they’re in between the guards and defensive tackles in the run game," Thomas said. "A lot of people are falling on their legs. Alex is a Gumby-like person. His durability is one of his best assets for any team because the worst thing that can happen on an offensive line is constantly shuffling rotations because of guys that are getting injured, so to have a reliable center is very important." Thomas hopes the Browns appreciate Mack’s value. "He’s one of the best centers in the NFL, and if we don’t bring him back, now we have a big hole to fill at center, which is one of the most important positions on the offensive line," said Thomas, adding that Mack’s intellect may be his biggest strength. "He has to be one of the best in the NFL at understanding the mental side of the game and getting everybody on the same page blocking wise." Mack was reluctant to talk about what could happen during the offseason, but Jackson made a strong case for the Browns keeping the center and Ward. "That’s the way you build a solid team," Jackson said. "You keep your young talent. T.J.’s having his best year as a pro. Alex has been steady ever since he’s been in the league. He’s one of the top centers in the league. You keep those core guys, then you build your team around those guys. If you look around the league, the good teams hold on to their solid talent. "Hopefully those guys are in the plans," Jackson added. NOTES: TE Jordan Cameron returned to practice after missing last week’s game with a concussion. Cameron, who has 75 catches, has to be cleared by an independent neurologist before he can play Sunday. … Ward also returned after missing Thursday’s workout with an illness. … CB Joe Haden (hip) did not practice this week and is listed as questionable on the injury report. Starting NT Phil Taylor and G Jason Pinkston will both miss the season finale with concussions.